The Ypres Cloth Hall was one of the medieval gems of Europe prior to 1914. It has once been the centre of the European cloth trade and home to numerous stalls selling cloth from across the globe. This trade had made Ypres rich, wealthy enough to fund its own Vauban designed defences during the long periods of conflict that followed. During the Great War the Cloth Hall came under fire during the First Battle of Ypres in October 1914 and then caught fire the same November. Some, but not all, of its many treasures were saved and gradually by 1918 it was reduced to rubble as every shell from 77m up to 420mm naval shells fell on it at some point. Only the central tower stood proud, but that in ruins and two years after the end of the war we see it in this photograph pretty much in the same state it was at the end of the conflict. 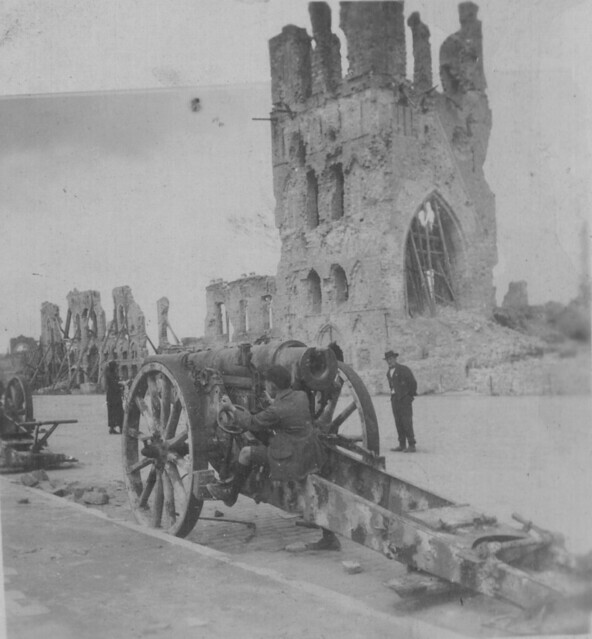 The howitzer was one of several war trophies on display in the main square at this time and appears to be a German 150mm howitzer. The photographers son is once again used for scale, as he sits on the gun. Ypres was gradually rebuilt, using the original medieval plans, but it took time – the Cloth Hall was not finished, for example, until the early 1960s. Today it houses the council offices and the In Flanders Fields Museum. This entry was posted on 02/04/2012 by sommecourt. It was filed under Aftermath, Battlefields, Belgium, Flanders, Great War, Western Front, WW1, Ypres and was tagged with Aftermath, Cloth Hall, Flanders, Great War, WW1, Ypres.